NORTH ADAMS, Mass. — A transgender rights advocate who started a pageant for transgender women in New England was found dead in her home Friday. Police say Christa Leigh Steele-Knudslien was stabbed and beaten to death by her husband. Steele-Knudslien is the first known transgender person to be killed this year, LGBT organization GLAAD said. She was found dead in her North Adams home on Friday evening. Her husband, Mark Steele-Knudslien, pleaded not guilty to murder on Monday, days after police say he admitted hitting her with a hammer and stabbing her after an argument. 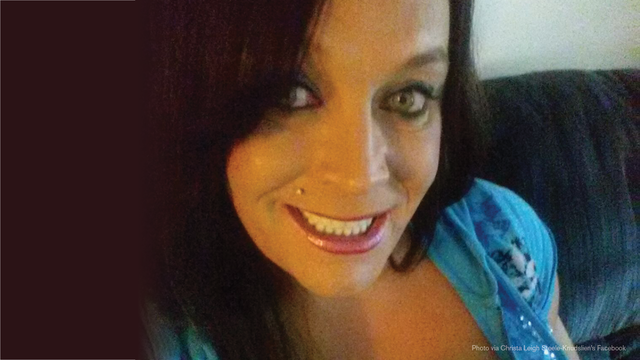 Christa Steele-Knudslien, 42, was well known in the Massachusetts transgender community for her activism and helped launch the first New England Trans Pride event a decade ago, friends said. She and other advocates later started the Miss Trans New England Pageant, which brought together transgender women from across the region, said A. Vickie Boisseau, who officiated at her wedding last April. Another longtime friend, Justin Adkins, said, "Her thing was always that transgender women are beautiful and need a venue for trans women to be seen as beautiful." Mark Steele-Knudslien, 47, admitted in an interview that he killed his wife, police said in a statement filed in the Northern Berkshire District Court, MassLive.com reported. The husband said he struck her numerous times with a hammer and then stabbed her in the back with a large knife before wrapping her body in a tarp, police said. He told investigators they got into an argument and he "snapped," adding that she was "always belittling him," police said, according to MassLive.com. He turned himself in at the police department on Friday, telling officers he had done "something very bad," police said. He was held Monday without bail. His attorney didn't immediately respond to an email seeking comment.